Scott Moore, a fellow new recruit alongside Mike McMeeken at Castleford. FORWARD RECRUIT Mike McMeeken admits he has a fight on his hands to break into Castleford Tigers’ first team, but insists he hasn’t moved north just to make up the numbers. The 20-year-old back-rower, who was signed by Tigers after impressing twice against them for relegated London Broncos last season, is still a relative novice at the top level and knows he may have to bide his team before getting an opportunity in what will be a hotly-contested role. But, at 6ft 4ins tall and 16 stone, he has the physical attributes to make a big impression in Super League and believes moving to Castleford, to work under coach Daryl Powell, will only improve his game. “I will be fighting for my place in the team,” pledged McMeeken, who made his Super League debut in 2012. “I want to be playing as much as I can, but at the same time I want to be developing as a player and making myself better. McMeeken, who can also play in the centres, has been training at Castleford since the start of the month. He added: “I am loving it, it’s a really good club to be at and there’s some familiar faces here, which has made it a bit easier. 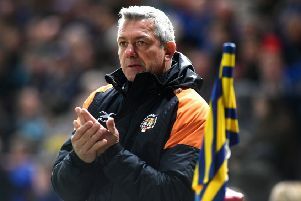 “Daryl Powell is a great coach and I was impressed by the way they turned it around last season from the season before. “It’s a club that’s going forward and aiming for higher this year than last year. “We have got a good squad together and I am really looking forward to the start of the season. There is a feeling at Castleford that McMeeken could develop into one of the most astute signings of the off-season and he gave them an indication of what he can offer during two stand-out performances against Tigers last term. “I scored in both games and I think I probably caught their eye a bit,” he said. “It probably helped me and Joey [London coach Joe Grima] was very supportive when he found out I was coming to Castleford. McMeeken is part of a sizeable ex-London contingent at Tigers, which also includes Luke Dorn and Michael Channing, plus recent recruits Scott Moore, Denny Solomona and Matt Cook. Though hailing from 200 miles outside the code’s traditional heartlands, McMeeken revealed rugby league is in his blood – and he feels players born and raised in the south will have a growing influence on the sport, despite the disappointment of London’s relegation into the Kingstone Press Championship. He said: “I am a southerner, I was born in Basingstoke and raised in Fleet, which is a few miles away, but my family are from up north, from Nantwich. “My grandad played for St Helens reserves and he was a big Saints fan and I think it has gone on from him. “My brother was in London Broncos’ academy and it’s through him I got playing for my amateur club, West London. I played union from when I was four and picked up league when I was 10. London Broncos have got a good academy system going down there.